We’ve seen games at some Redbox locations for a good while now, but it looks like the kiosk rental service is finally ready to throw down for realsies. Games will be coming to 21,000 locations starting on June 17, and they’ll be rentable for $2 per day. Sounds like a good deal to me — most single player campaigns these days can be finished in a couple serious sit-downs. And of course now when you’re picking up beer for the party, you can grab… I don’t know, We Dare or something. You’ll probably end up making out with your roommate. Just like the ads! April 28, 2011 –Redbox, America’s movie rental destination, today announced it will offer video game rentals at more than 21,000 redbox locations nationwide beginning June 17, 2011. Top video games will join new release movies for only $2 a day complementing $1 DVD and $1.50 Blu-ray™ daily rental prices. The announcement follows a test of video game rentals in select U.S. markets that began in August 2009. Redbox, a Coinstar, Inc. brand, has tested video game rentals alongside movies at 5,000 redbox locations. “Redbox has rented more than one million video games in less than two years at these locations, underscoring the popularity of video game play in America,” added Lowe. Today, nearly 64 percent* of people in the United States own a game console. Upon launch, redbox will feature games across the three major console platforms: PLAYSTATION® 3, Nintendo Wii™ and Xbox 360®. Video game titles will range from top releases to popular family and kids titles. “Redbox will make discovering the latest games as easy as a trip to the local grocery, convenience or drug store,” said Joel Resnik, vice president, games, redbox. 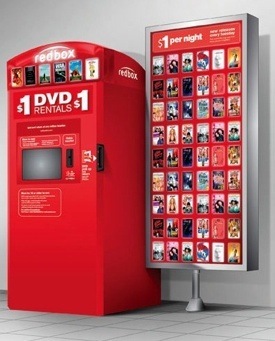 Redbox Automated Retail, LLC, a wholly-owned subsidiary of Coinstar, Inc. (NASDAQ: CSTR), offers new release DVD and Blu-ray Disc rentals through its network of conveniently located, self-service kiosks. Redbox has rented more than one billion movies and is available at more than 27,000 locations nationwide, including select McDonald’s restaurants, leading grocery, drug and convenience stores, select Walmart locations and Walgreens locations in select markets. For more information, visit www.redbox.com.